HESI Root Complex is a plant stimulator for healthy roots. At the same time, through the activation of the bacteria in the soil, the absorption of fertiliser into all plant substrates is optimised, leading to healthy plant growth and improved strength. 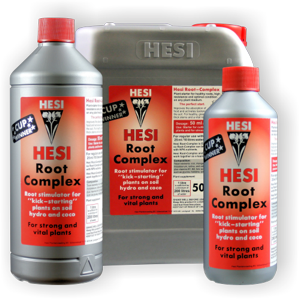 Especially after planting or repotting, HESI Root Complex ensures the rapid forming of new roots and creates the conditions for a functioning photosynthesis. The stress after repotting is significantly reduced. HESI Root Complex is a stimulator and does not contain fertiliser. It does not increase the salinity (conductance), is pH neutral and can be used together with a fertiliser. chelated trace elements such as iron, manganese, zinc, copper, boron, molybdenum, iodine and cobalt in complex-bound form, plus Vitamin B1, B2, B12, folic acid, plant sugars, amino acids such as glycine, histidine tyrosine and plant active enzymes. Root Complex for orchids and other plants regularly every two weeks, additional use after planting or repotting. Give Root Complex to imported plants and young plants every week.